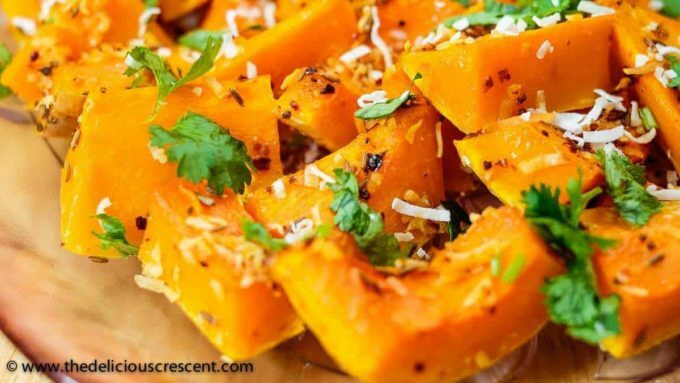 Spice roasted butternut Squash – super easy, scrumptious, gluten free, perfectly tender, packed in great flavors and rich in nutrients! This dish is the taste of home to me. The taste of my mom’s cooking. The ginger, the cumin, the coconut, the cilantro and the pungent red chili flakes. 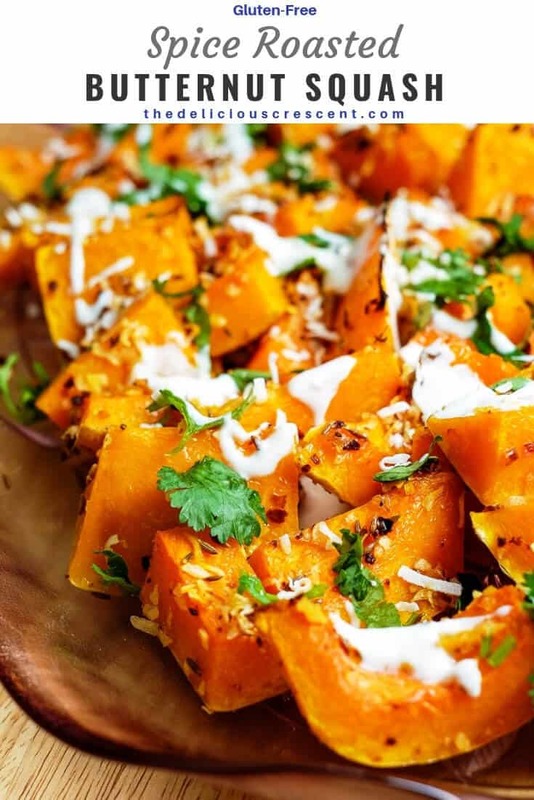 Most often butternut squash is roasted with sweet spices and flavors. But in my childhood, I remember my mom cooking a variety of yellow orange squash with savory spices. And it was damn good! Although the one I prepared here is different from her recipe, the flavors I have used here remind me of many of her other veggie dishes. 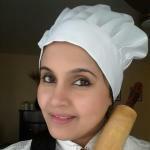 So the inspiration for this recipe is my mom’s food! I have lately been obsessed with butternut squash as you may have already seen this recipe – Eggplant Yogurt Salad with Pomegranates Walnuts and Pita Chips – where I talk more about the nutrition potential of this lovely winter squash. And if you want to try yet another fascinating squash that is also a nutrition marvel then check out my Spaghetti Squash with Chicken. Now on to some juicy tidbits about ginger. Ginger is part of the Zingiberaceae family along with cardamom and turmeric. And it has been found to have several anti-inflammatory and antioxidant compounds, the main active one being the gingerols. Research has indicated that these compounds may be beneficial in pain reduction in arthritis, treatment of inflammation and inhibition of the growth of human colorectal cancer cells. Since ancient times ginger has been trusted for relief of digestive problems such as nausea, loss of appetite, morning sickness etc. Ginger is also a diaphoretic – which means it promotes healthy sweating and therefore is valuable for its warming properties in cold weather. In most recipes, ginger is used in only small quantities, so it does not add a significant amount of calories or carbohydrates, but adds a lot of flavor and zest to the dish. Spice roasted butternut squash is one of my favorite ways to cook this winter squash. So quick and easy! And what a delicious and spicy way to warm up this winter! Spice roasted butternut squash - super easy, scrumptious, gluten free, perfectly tender, packed in great flavors and rich in nutrients! Use a vegetable brush and scrub the surface of the butternut squash and rinse really well. I prefer to leave the peel on as it has a nice bite to it once it is cooked. Cut the squash into medium size wedges. If you prefer the spices and flavors to penetrate more deeply, you may cut smaller pieces. If you prefer to get a good taste of the squash itself, then you may cut it into bigger wedges. Sprinkle the coconut, cumin, ginger, red pepper flakes, salt and drizzle the olive oil all over. Toss the butternut squash to coat all the spices and ingredients well. Scatter the butternut squash pieces skin side down on a lined baking sheet. Allow the squash to roast for about 25 to 30 minutes until tender and lightly browned on the edges. Meanwhile, whip the yogurt with the grated shallots (if you prefer). If the yogurt is not tart enough, you may stir some lemon juice as per your taste. Remove the squash from the oven and transfer to a serving platter. Garnish with chopped cilantro and drizzle of yogurt. 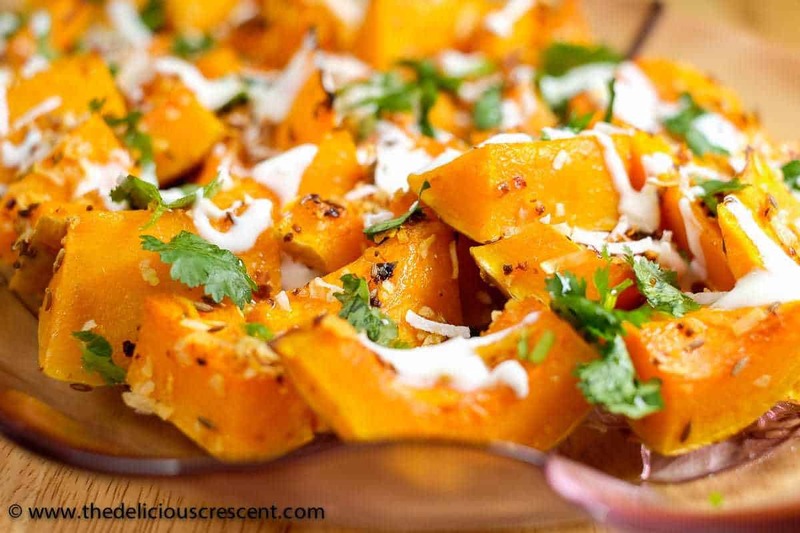 Enjoy this spice roasted butternut squash as a side dish. 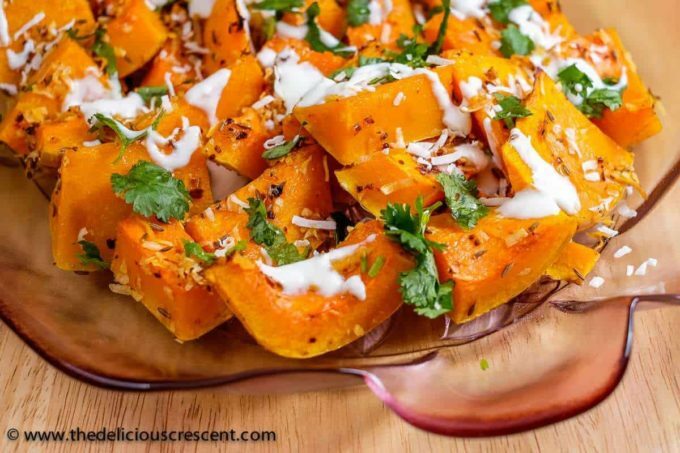 I eat butternut squash once a week and would love to try this those flavors are really going to make the squash taste amazing especially roasted .. Yes its a nutritious vegetable and so tasty too. Hope you enjoy this recipe. I love these flavors! 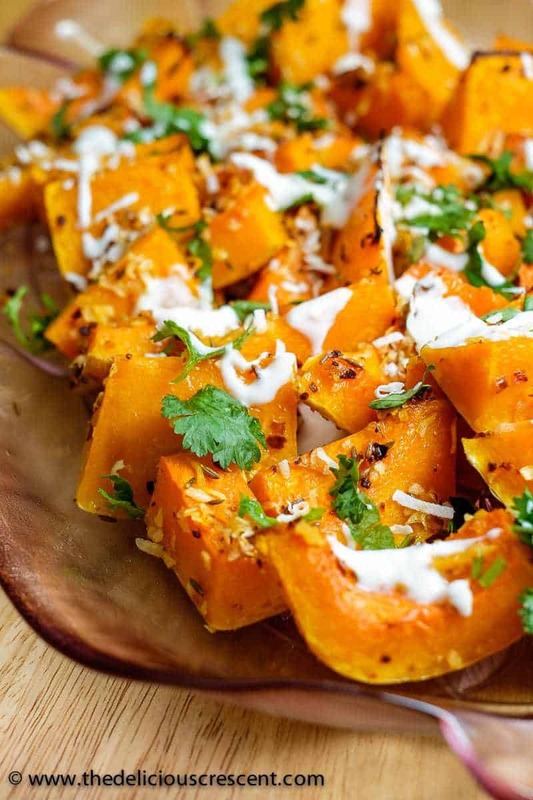 Butternut squash is one of my most fave veggies, so I really need to give this a whirl. I love butternut squash too…..very much. And I am so happy you like this version.